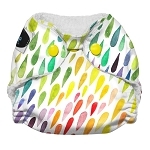 Newborn cloth nappies are ideal for the first few weeks most fit babies from 6lb and can last until they weigh 15lb depending on babies shape and whether they are a heavy wetter. 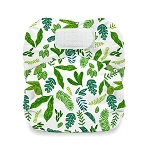 Although one size nappies are often labeled as birth to potty nappies most don't fit until babies are around 8-10lbs the main area where they don't fit well is around the legs - gaping legs and explosive baby poo is often a bad combination - I have been there!!!. 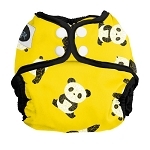 We often get asked about the babies first sticky tar like poo staining the nappies we had no problem with that but you can use a paper or fleece liner both of which will need to be cut to size to fit in a newborn nappy especially the all in ones or fitted nappies. 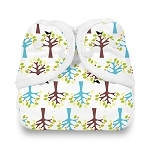 Newborn babies can need changing every couple of hours so to use full time and wash every 2 days you will need 24 nappies. 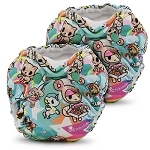 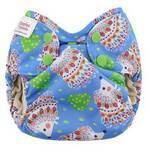 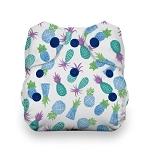 All in one - these are a complete nappy combining waterproof outer and a absorbant inside these are ideal for fast changes such as during weighing at baby clinic. 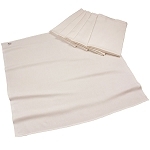 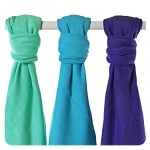 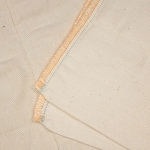 Prefolds - these are ideal for newborn and are hugely popular in the USA, prefolds are made from cotton, bamboo, hemp or a combination. 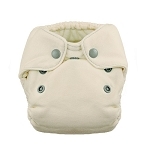 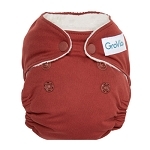 When baby has outgrown the prefolds they can be used on another baby or as a insert or booster in one size nappies. 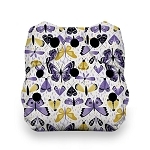 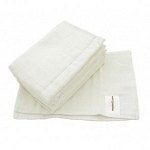 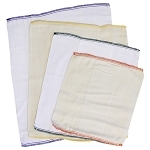 Terry nappies - available in cotton or bamboo we had 50cm terry squares for our little girl folded and fastened with a nappi nippa provided great containment when paired with a wrap.